Do not think I don't hear your screams of protests, young Neopian. "The invisible paint brush? Ha! I'd rather stay the night in the Haunted Forest!" or "I'd rather only ever win a booby prize at Tombola ever again!" or even "I'd rather spend the rest of my days trying to come up with something that King Hagan doesn't already know!" Once, I was as prejudiced against the innocent paint brush, too. Once, I would wrinkle my nose in confusion in the same naive way at the mention of the elusive brush. But not now. Not anymore. One of my own pets came home the other day after a long day at Neoschool in floods of tears. Of course, I was concerned, because my pets are my first priority, so after giving the Wheel of Monotony a bit of a spin, I asked her what was wrong. "Sammy got a paint brush for his birthday, Mom," she cried hysterically. "A paint brush! I'd never get something like that for my birthday." "Hey, I thought your Bacon and Broccoli Omelette was a pretty good birthday present!" I'd replied, stung. "A PAINT BRUSH," she'd repeated, more tears flooding out of her eyes into a nice puddle at her feet. "All I ever wanted in life was a paint brush!" Ungrateful kid. No more Bacon and Broccoli Omelettes for HER. Anyway, the next day at Neoschool I went over to see Sammy to see exactly what all the fuss was about. But he was nowhere to be seen - was he such an amazing colour now that he was scared of coming into school anymore, in case he breathed in the same air as the filthy, NORMAL-coloured pets or something? His owner's answer wasn't one I was expecting. "What? Sammy's standing right here next to me," he said, managing to beam proudly while uncertainly patting the air next to him. I laughed out loud. That night at home I asked Sunny why she was making such a fuss. "An invisible paint brush? Why would you ever want one of those?" Sunny couldn't come up with an answer, so she sulkily retreated out of the kitchen to go pester one of her brothers. However, I shortly came up with an answer of my own. Sammy's owner was a complete genius! An invisible paint brush is the only thing you could ever want in life! Close your eyes. Imagine the scene - you've spent a long while trying to win an auction over a piece of Bacon and Broccoli Omelette, as a last-minute for your pet's birthday the next morning. Now, you're retiring home, tired and hungry and in a pretty bad mood because you're tired and hungry. Only, you're sort of dreading coming home. Because home=chaos. Especially if you have more than one pet and they have beloved petpets, (maybe they even have a petpetpet). Your home is always louder than a Chomby and the Fungus Balls concert. Wouldn't it be so nice if you could just come home to a bit of peace? To come home and see your quiet, tranquil, EMPTY home instead of your pets screaming at each other? Now, with the Invisible Paint Brush... this could happen. You'd never see your pets - you'd never have to worry about them again! Woohoo! Say goodbye to responsibility! Admittedly, you could probably still hear them fighting, BUT buy yourself a pair of Kacheek Earmuffs, and waheey, problem solved. The Invisible Paint Brush is the way forward. Meh, so it may cost a little... well, ahem, it's gonna cost you 80k-90k, but hey, the best things in life are gonna cost you! And it's for such a good cause. An invisible paint brush is a life-long investment - once your pet is invisible, it'll never be painted again! But no, seriously, it really won't be; you won't know where it is so you won't be able to drag it to the Rainbow Pool or anything. Being invisible gives your pet so many opportunities. Not only does it give their beloved owner the illusion that their Neohome is under control, but it gives them a bit of personal space. The invisible paint brush is ideal for a shyer pet, who can hide away from the world. 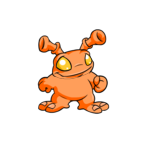 Or the more rebellious pet, who can hide away from Neoschool. Whatever. And besides, being invisible is a total fashion statement. It's INvisible, meaning IN fashion. Being invisible isn't ridiculously popular, which makes it instantly cooler. I mean, how many people do you know who say their favourite paint brush 'has always been the invisible one'? In fact, in a recent poll with my group of trained, professional researchers (ahem) it appears that the Invisible Paint Brush may or may not be the last brush you would think of choosing to get for free, if you had the choice of getting any of them for no neopoints whatsoever. * (Ha! Like that'll ever happen, buddy). *= these results may or may not have been completely made up for the sake of this article. Ahem. But the invisible brush really is the 'it' topic of conversation right now - "is YOUR pet invisible yet?" Keep one step ahead of the crowds and get invisible now. Your pet will be the height of jealousy - just look at the effect Sammy-the-newly-turned-invisible-pet had on my Sunny! Your pet will have other pets all over Neopia in tears. Doesn't that make you feel powerful? Like Dr. Sloth or something. Muahuahahua. The Invisible Paint Brush was a gift sent by someone kind and sweet and considerate. It gives the owner some time to relax, the pet some privacy, and the two of you a 'we're-so-cool' reputation you won't be able to get any other way. So what are you waiting for? Look at your pet itching - no, they haven't got the Itchy Scratchies, they're itching to get an Invisible Paint Brush, of course! This is me, deeepbluesea, telling you now - Invisible Paint Brushes are a good thing. In fact, they're not just good, they're brilliant. They're better than a piece of Bacon and Broccoli Omelette is ever going to be, anyway..
B.E.G. : Big Evil Grin.